twinkling lights as the good citizens of Chennai made sure to make the last week of this year really count. Friday saw us at Rohan and Neha Ryanai??i? ?s, where everyone insisted they were taking it easy and pacing themselves for the weekend ahead. Those thoughts were probably forgotten somewhere along the way, with the dancing carrying on till the wee hours of the morning. Those who survived managed to make it to my place on Christmas Eve, dressed in their Christmas colours, and in surprisingly good spirits despite the exertions of the night before. A special mention to the boys for bringing out their exclusive ties for the occasion. After lots of wine, a chaotic secret Santa ensued, with everyone attempting to make sense of the madness. Sunday then saw us really feeling like soldiers, as we got dressed up to head off to the annual Christmas lunch hosted by Ravi and Tehzeeb Katari. As always, our hosts outdid themselves, with a fantastic spread that had to be seen to be believed. Turkey, stuffing, gravy, potatoes and a delicious roasted ham. Add to that loads of homemade eggnog and you can understand why we had to be rolled out of there. Meanwhile, in different places across the city, the ai?? ?party peepsai??i?? were enjoying their Christmas brunches. Hilton and The Leela Palace were the venues of choice, with long lazy brunches that turned into sundowners. women) for themselves, with words like ai?? ?egg-shaped spongesai??i? ?, ai?? ?brow pomadeai??i?? and ai???atomiserai??i?? being thrown about. 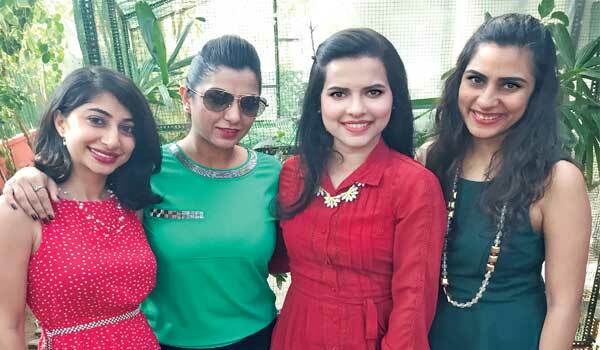 The beauty trail continued across town at the launch of ABC Cosmetic clinicai??i? ?s latest branch on TTK road. Actor Soha Ali Khan was all smiles for the cameras as she did the honours.